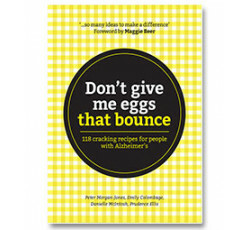 Don't give me eggs that bounce: 118 cracking recipes for people with Alzheimer's is a breakthrough cookbook that reclaims the enjoyment of food for many who have missed out for too long, making it wonderfully accessible through innovative recipes and extensive practical knowledge. Don't give me eggs that bounce celebrates the dignity of older people, people with dementia and those with eating difficulties by offering nutritious, glorious food across a range of dietary needs, letting the 'flavours do the talking'. Australia's leading aged care chef, Peter Morgan-Jones, has prepared innovative recipes which draw on his extensive international experience, with one recipe even inspired by cooking for a 'young prince' at Highgrove House. Many of the dishes have been shared in his daily work in HammondCare's dementia cottages, much to the delight of residents and families. He is ably supported by HammondCare experts who join Peter in writing on how to make mealtimes a pleasurable, social and safe experience in the context of dementia, ageing, swallowing difficulties and texture-modified diets. Thanks to Don't give me eggs that bounce, even people facing major eating difficulties will find a tasty range of food and drink that they can enjoy. At the same time, people who eat a regular diet will find dozens of recipes, tips and techniques to enhance their culinary experience. 'I can't tell you how proud I am to be asked to write the foreword for this truly exciting, important book. Reading through I was blown away by the practical knowledge shared in such a readable way.' Maggie Beer, Celebrity Cook, Senior Australian of the Year 2010. It's all about the food not the fork!